Čeština: Gregor Johann Mendel (1822–1884) byl mnich, zakladatel genetiky a opat augustinianského kláštera v Brně. Deutsch: Gregor Johann Mendel (1822–1884) war Augustinermönch und Naturforscher. 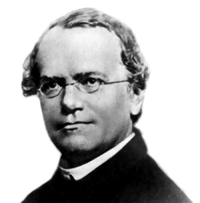 English: Gregor Johann Mendel (1822–1884) was an Augustinian monk who is often called the "father of genetics" for his study of the inheritance of traits in pea plants. Español: Gregor Johann Mendel (1822–1884) fue un monje y naturalista, frecuentemente llamado "el padre de la genética" por su estudio de la herencia de rasgos en plantas de guisantes. Türkçe: Gregor Johann Mendel (1822–1884) bezelyelerin özelliklerinin mirasını araştırdığından çoğunlukla "genetiğin babası" olarak adlandırılan bir Augustinian keşişti. Memorial plaque of Gregor Johann Mendel at University building in Mahlerova street, Olomouc, (Czech Republic). Augustinian Monastery and Basilica of the Assumption of Our Lady, Brno, Czech Republic. diagram showing the seven "characters" observed by Mendel. Цю сторінку востаннє відредаговано о 17:04, 30 листопада 2018.